Product prices and availability are accurate as of 2019-04-24 10:11:22 UTC and are subject to change. Any price and availability information displayed on http://www.amazon.com/ at the time of purchase will apply to the purchase of this product. Express your adventurous side with the Coaster Company of America White Trunk Accent Table! 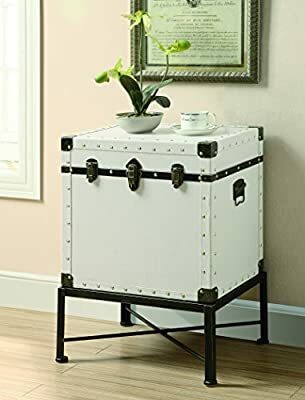 This winning accent table features a handsome white steamer trunk with black corner caps and silvery rivets reinforcing every edge. The top doesn't have a handle to get in the way, so you can set up a lamp or plant in style. The trunk opens to provide concealed storage space. Try this accent table as a fashionable and unique nightstand! A metal stand is included to amp up the industrial chic tone while allowing you to sweep underneath. 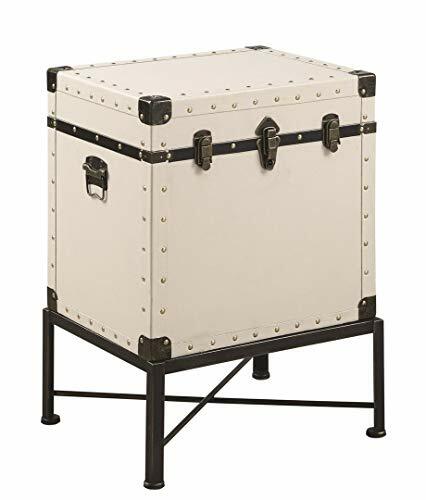 Dimensions: 19W x 15.75D x 25.25H in.. Travel trunk features wooden construction. White trunk with black accents and silver rivets. Metal base with X-stretcher. Blackened finish on metal base. Adventurous “Campaign furniture” styling.